The Australia-China Student Forum (ACSF) is an exchange forum to Chongqing University, which aims to create a vibrant, intercultural platform for the youth of Australia and China. Together, we will enhance cultural diversity awareness and to develop cohesive understanding through a series of academic and cultural activities. This forum is jointly organised by La Trobe University (Confucius Institute and School of Social Sciences), and Chongqing University, China. It is funded by the Office of Chinese Language Council International (Hanban) who are an organisation affiliated with the Chinese Ministry of Education. It was developed following the success of the ACSF – Beijing, which was previously organised by La Trobe University (via the Centre for China Studies), Peking University and Beijing Foreign Studies University. to enrich the learning experience and encourage students to undertake in-country studies, both in learning another language and gaining greater intercultural understanding. What do you know about the history of Australians’ encounters with China during the late 1800s and the early 1900s? The era marked China in a grand transformation from the Qing Empire to the Republic, and Australia in between of the former British colonies and the formation of the Federation. What can you learn from George Morrison’s travel and work in China in 1894 to 1919? What do you know about the allied history of Australia and China during the World War II, when the two countries both faced the aggressions from the Japanese military? What can you learn from Fredric Eggleston’s experience of leading Australia’s Chongqing legation from 1941-1944 during the war? 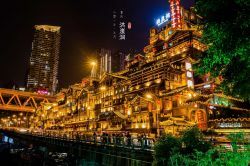 How do you understand the changed and the unchanged in the history of Chongqing city? Please reflect on Morrison’s An Australian in China (1895), the exhibition of The Chungking Legation: Australia’s diplomatic mission wartime China and your visit in Chongqing today. Phase II: Presentation and Dialogue: comprises keynote sessions by high profile speakers, student presentations and a dialogue on a key topic. Interactive activities with local students and communities, cultural activities and excursions will also be included in the forum. 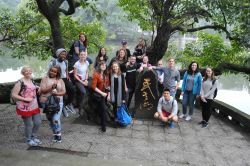 To achieve higher quality outcomes, La Trobe University students will be required to participate in a 20 hour pre-departure Chinese language course. The course will be specially designed for this forum and students will acquire basic language skills to assist their China experience. Exemptions will be granted only to those participants who can demonstrate language proficiency. All participants will receive a certificate from the hosting university upon successful completion of the forum. The number of participants in this forum is up to 20 students from La Trobe University. All currently enrolled students of La Trobe University are eligible to apply. Be willing to commit to the activities of the program. All participants are required to sign a Confirmation of Acceptance Form before the start of the program. Note: Fees provided are indicative only and subject to the pricing of external service providers. It is suggested that you take some money for emergency and/or personal shopping expenses, at least $200, and have access to a credit card or debit card for additional money, if needed. Australian citizens enrolling in an Australian university and be undertaking a Bachelors or Bachelors Honors degree level program onshore at an Australian campus. *You will need to submit Overseas Short Program (OSP) applications online -https://www.latrobe.edu.au/students/opportunities/exchange/short-programs/apply Once you successfully apply, La Trobe Abroad Team will pay the NCP grants 1-3 weeks before the program dates. If a student (both domestic and international) receives prior agreement for the assignment of 15 credit points (equivalent to one unit) exemption from their school upon successful completion of the 2018 Program, students may be eligible to receive a $500 Mobility Grant. Written approval from the course coordinator will be required to access this grant. Confirmed to be receiving academic credit or completing a mandatory component of your course upon completion of the ACSF. For more information regarding funding, please send direct queries to studyabroad@latrobe.edu.au. If more than two eligible applications are received, a selection process may occur. Students may apply for OS-Help loan for their study overseas in formal exchanging programs. For further detailed information, please visit: Loans for overseas study.